Before replacing your garbage disposal, check a few things first. If it still won’t work, give me a call. Something may be in there that should not be. 2. To make sure you turned off the correct breaker, turn on the switch to the disposal. The unit should NOT turn on. 4. Remove any objects and then turn the breaker in the breaker box back on. 5. Turn the disposal on. If it still hums, turn it off. 1. Take your flashlight and look at the bottom of the garbage disposal. 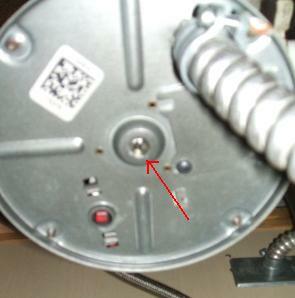 Most units have a red reset button (see picture). Push the button in. 2. If the disposal does not work, check for any tripped circuit breakers in the breaker box. Most household garbage disposals are one third or one half horsepower models. You can spend more money and get three quarter or one horsepower models. Prices range from about $70.00 up to almost $300.00. You can look at the garbage disposal you have and see if there is a horsepower rating on it. Note: If you use the disposal a lot, you might want get a one half or three quarter horsepower model instead of the one third. If you buy the disposal yourself, i charge $ 90.00 labor to install it PLUS any parts that may be needed. 1. Avoid putting in eggshells, bones, grease, stringy/fibrous things such as celery. 2. Every once in awhile, turn on the hot water, turn the disposal on, and throw in a few ice cubes. This will help to keep it clean.